Successful execution, exceptional customer service and lasting strategic impact starts with Focus – articulating a clear vision of where the company should be, keeping in mind the needs of customers, stockholders, and employees. We work with companies to develop the goals and strategies that will get them to that vision and Align those to the daily work of the company. We help leaders to Engage employees in the vision and actions required to deliver results. And we work together to focus the vision, align actions, processes, and technology, and engage people to deliver sustained Excellence. The Case Studies below illustrate how we worked with various businesses and organizations to address their immediate needs while delivering significant, long-term improvements. QHow do you focus business strategy and align talent in the face of extreme competition? Client Need. CEO of a major international energy company needed to completely transform the company’s business strategy and develop a strong leadership team to implement necessary changes. Solution. Excel Leadership Solutions helped the client create a strategic roadmap and tactical plan for a new customer-oriented business strategy – three-legged stool. After first gaining a deep understanding of the organization, we facilitated strategic planning and developed a key prioritization tool. We worked with the company to align its talent decisions with the new organization’s structure, culture, and customer goals. Results. The senior leadership team developed a complete business strategy for the new organization and determined key resources needed to support the strategy. In addition, they identified immediate action with two key customers and selected individuals for succession in the new culture. QHow do you align a diverse workforce around a new corporate-wide initiative? Client Need. A healthcare organization in a highly competitive market grew through acquisitions but faced a resulting cultural “melting pot,” threatening the company’s reputation for patient care. Solution. Excel Leadership Solutions worked with the organization to identify its core vision, determine the six key values that underpinned the firm’s concept of service excellence, and ultimately implement the vision and values throughout the company. We facilitated staff coaching and training in the core behaviors to bring these values to life, as well as helped organize and deliver customized workshops for the leadership teams in each facility. Results. The firm is tracking an increase of 10% revenue and 5% gross profit. QHow do you ensure success when realigning for growth? Client Need. Executive leadership change transformed business direction and management style at a global defense contractor. Solution. Excel Leadership Solutions worked with leadership to plan and implement a significant realignment initiative throughout the organization. We provided coaching to the new executive leader and helped develop the realignment communications plan. 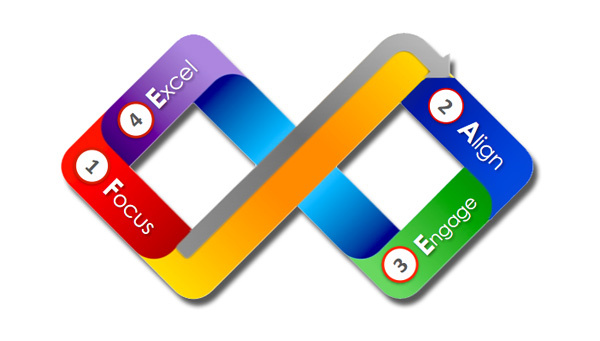 Excel employed a unique approach of exploring paradox to help identify clear action steps and measurable change metrics to develop an implementation plan. Consultants facilitated the change process by involving a representative sample of 50 associates to help identify action steps, communicate the realignment throughout the organization, and identify key areas for change. Results. Excel Leadership Solutions’ work clarified the company’s direction and set in motion a five-year plan with ownership of the organization at all levels. Our high energy and accelerated approach helped establish the realignment strategy and implement change rapidly with minimal organizational disruption. QHow do you ensure the senior team is aligned on the strategic direction of the organization? Client Need. A Belgian senior team, leading a distributed network of sales offices, realized they needed a serious review of the company’s sales and operating models. Solution. Excel Leadership Solutions worked with the leadership team to define the sales and operating model by helping the team clarify the company mission, vision and three year strategy plan priorities. We then worked with the team and a cross-section of the organization to define structures and processes, and pivotal roles and behaviors necessary to improve integrated planning and execution between home office and sales sites. Results. The company experienced a 30% increase in qualified sales activity in the field, accelerated and improved involvement in decision making, as well as a markedly increased in leadership engagement with the sales process. QHow do you transition to leadership and set a new direction for the team while continuing to perform at a high level for your customers? Client Need. A healthcare organization underwent a senior leader transition accompanied by a new direction and cultural shift. Solution. The new direction, moving from a parental to a performance culture, was met simultaneously with added pressure on company growth from governmental regulations and patient expectations. Excel Leadership Solutions facilitated a “transition in leadership” process to align expectations of the new leader and leadership team. After individual, confidential interviews with each member of the leadership team, sharing the summary only with senior leaders, consultants facilitated a half-day meeting to share the expectations and create personal commitments. During the meeting, the team also developed an action plan to implement the new, aligned direction. Results. The leadership team continued to perform at a high level and averted what could have been a 6-12 month loss of productivity due to the alignment of expectations, communication, and work processes. QHow can your team make better decisions? Client Need. After 10 years of acquisitions, a 25-year old chain restaurant business realized it was losing control of cost, quality, and associate engagement at the cafe level. Solution. Excel Leadership Solutions aimed to uncover the foundational issues and help the client define action necessary to get the balance back. We designed an accelerated process to surface paradoxes, the inherent tensions in the current business and operating models, which helped to identify risk indicators and potential opportunities. We also clarified key actions and metrics to leverage the positive aspects of the paradoxes and to mitigate risk. Results. While the company is still in its first year of implementing these changes, the chain has already demonstrated positive decision-making to better balance centralized and decentralized decision-making, customer and associate needs, as well as short- and long-term planning. QHow do you coach leaders while simultaneously achieving growth targets? Client Need. With dramatic growth opportunities in emerging markets, a staffing and leadership challenge arose for a corporate-owned rental-car chain regarding how to develop employees while focusing on customer service and profit margins. Solution. Excel Leadership Solutions co-created and deployed an approach that combined leadership and business development coaching. Coaching focused on setting direction, attracting and engaging talent, delighting customers, and leading by example. We customized the coach management system to ensure coaches were aligned with the organization goals and enable peer support, while tracking coaching dollars and outcomes. Results. As a result of this coaching approach, over a two year period, the company saw an increase in sales, reduction in turnover, increase in productivity, and increase in both customer and employee satisfaction. QHow do we develop our high potential leaders? Client Need. Increased demand for products and change of business model caused agribusiness to look inside for future bench strength. Solution. Leveraging current developmental structures, Excel Leadership Solutions teamed with the client to bring cohorts of high potential leaders together in an integrated learning experience involving multiple sessions, business simulation, virtual learning, individual coaching, 360 assessment, feedback, and a residential week at the company headquarters location. Results. Over a three-year period, the integrated learning approach has become a systematic and strategic development tool as high potential cohorts are now brought into strategy creation conversations for the corporation. QHow do you re-instill confidence in long-time customer who put you “on notice”? Client Need. Complacency and outdated processes put client at risk of losing primary customer – 60% of the business! Company needed changes in work model and processes to drive results and gain back customer’s trust and satisfaction. Solution. Excel Leadership Solutions first assessed the organization’s existing work models and processes to measure effectiveness and performance gaps. Using the empowering framework methodology, critical issues and areas for improvement emerged. The framework helped to identify core elements to act as levers for change throughout the organization. We worked with the executive team to drive change from the top. We helped align and engage the organization and its leadership to core goals and revise its work strategy. The team developed an implementation plan, which identified key performance metrics and established a process for engaging the next level of leaders in the organizational change. Results. As the implementation process neared completion, on-time delivery, cost, quality and safety metrics all exceeded first year goals, continuing on to achieve second year goals. The company re-gained its primary customer – bringing back 60% of the business! QHow can HR bring greater value and accelerate desired business results? Client Need. Despite building credibility within a major financial services firm over the past few years, the senior Human Resources (HR) team received recent feedback that they were not delivering value the business needed and the business partners required. A gap of understanding emerged about what the partners, and the organization needed, and what was being done within HR. Solution. Excel Leadership Solutions worked with the Executive HR Leader and his team to define how to better partner and serve their clients. After conducting a “voice of the customer” assessment to hear what was most important to the partners, we designed a series of strategy and development sessions, culminating in specific implementation plans. Results. Actions were validated with partners and, over the first year, feedback showed a 30% improvement in the HR team delivering on what was most important to partners. QHow do you build capability for the future? Client Need. A global multicultural company needed to raise the capability of its leaders as customer demands and expectations of cost, quality, and efficiency steadily increase. Solution. Excel Leadership Solutions collaborated with the client in the design and delivery of two integrated leadership development processes. The processes focused on increasing alignment and building a global mind-set through multi-session forums, involving company business leaders and facilitating growth and skills development in areas such as: leading and managing, virtual teaming, cross-cultural communication, rapid decision making, and leading by example. We facilitated assessment, peer feedback, and team projects to support these development processes. Results. Company leadership reported dramatic shifts in the global culture, including a reinvigorated company culture of alignment and accountability. QHow do you ensure you have your next generation of leaders? Client Need. An insurance firm recognized the emerging realities for its future yet lacked a structured succession plan to ensure the right leadership present in the pipeline. Generated an implementation plan to cascade the process to all levels of the organization, including steps to identify leadership potential. Results. The executive team emerged aligned around future realities and the leadership capabilities required. The firm identified three strategic hires and selected successor candidates. Two individuals were promoted within weeks of the process and all others quickly entered into an accelerated development process. Succession has become a priority step in the strategic planning process and integral with the business planning.